An online forum is a piece of website software which people mainly use as a discussion portal. They can create new threads or posts in the forum, express their views and opinions and also comment to others’ posts. People register in the forum as members and they can create posts and reply to them. The posts will be monitored and moderated by an admin of the forum. The comments they post are public and is readable by anyone who has access to the thread. The forum will have certain rules and the members are abide to obey them. There are a lot of commercial and open source forums available these days, just like MyBB. Simple Machines Forum, abbreviated as SMF is one of the most popular open source forums available for use. This post explains how to install Simple Machines Forum through the most popular control panel called cPanel. Most cPanel providers offer a one click software named Softaculous which helps you to install Simple Machines Forum at a single click. Softaculous provides a lot of software in its store, and users can install it very easily without having to undergo any long process of creating databases or assigning users or anything. Just fill in a few details and you are done !! 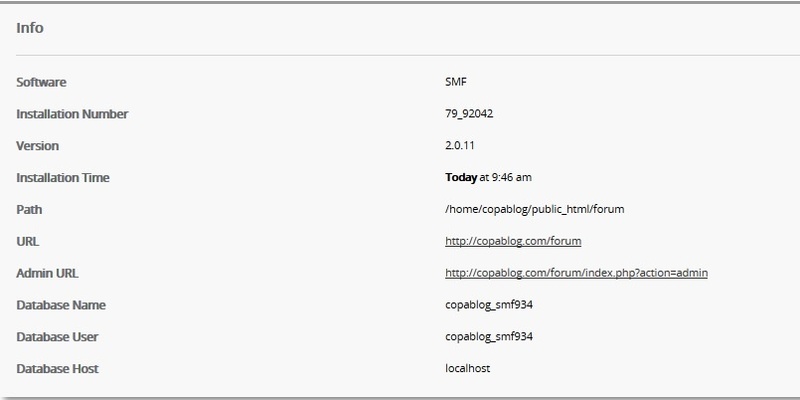 Suppose I have a website named copablog.com and I want to install a forum under it. Follow the step by step instructions given below to install Simple Machines Forum (SMF) in your website. Scroll down to the section named Softaculous App Installer. It will list all the software present under Softaculous. Click on SMF which will take you to the installation interface. The installation interface has an ‘Install Now’ button and while scrolling down it will list all the current installations of SMF under that domain. We are installing it afresh, so click on the ‘Install Now’ button to start the process of install simple machines forum in your website. The next screen that appears will ask you a few questions, so that Softaculous can install the SMF forum as per your requirements. Given below are the questions. a) Choose Protocol - http or https based on whether you require SSL or not. b) Choose Domain - Enter the domain name under which you want to install the forum c) In Directory - If you want the forum to reside in a subfolder, enter the directory name there. Otherwise leave it blank so that the forum will be installed in the base directory and will be accessible as http://domainname d) Board Name - Choose any name that you would like to give for your forum e) Visual verification image to display - Since it is a forum, chances for it to be misused by spammers is high. Hence, the forum offers various verification techniques to ensure that the one who is posting in the forum is not a spammer or bot but a human. You can choose from the list of verification methods available. f) Board Email - It is the forum's email address g) Admin Username - Every forum requires an administrator to monitor the posts and manage the forum and its users. You can enter any name as the admin username. This user will be the super user and will have full control over the forum h) Admin Password - Password of the admin user chosen above. Make sure to give a strong password. It is recommended to generate a random password by clicking on the key icon to the right of this column. i) Real Name - Name of the Administrator j) Admin Email - Email address of the administrator k) Select Language - Choose the language in which you want the contents of the forum to be displayed. c) In Directory - If you want the forum to reside in a subfolder, enter the directory name there. is recommended to generate a random password by clicking on the key icon to the right of this column. k) Select Language - Choose the language in which you want the contents of the forum to be displayed. I have a domain copablog.com (for example) and I need the forum to be accessible as http://copablog.com/forum. Hence I will install SMF in the sub folder ‘forum’. Rest of the details are filled in as shown in the image below. We chosen the language as English, and once again confirmed that all details are entered correctly. After that click the ‘Install’ button to start with the installation. Depending on the hosting you are, it may take a few minutes for the installation to complete. 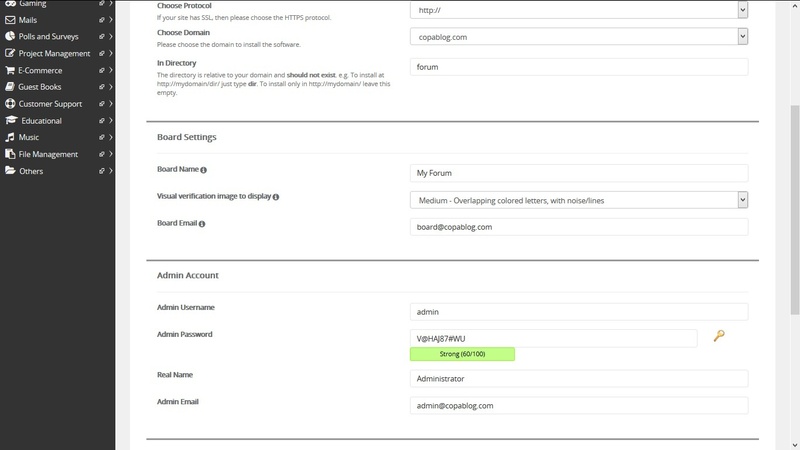 The installation will automatically create the database, username and associated privileges. Once the installation is completed, you will see a message as follows. Click on ‘Return to Overview’ link at the bottom of it and you will be taken back to the main page. It will now list your forum installation which was just finished. Towards the right of it, there is a pencil icon, clicking on which you will be able to edit the installation details like the installation folder, database details, admin login details etc. In addition, it will also list all the information related to the current installation. Note the admin URL in it, as you will require that to login to the forum as administrator. In the image above, my forum URL is http://copablog.com/forum/. Acessing it will take me to the forum page as follows. The admin URL for the installation is shown in the Info page, clicking on which you will be asked for the admin login details. Enter the admin username and password you provided during installation. 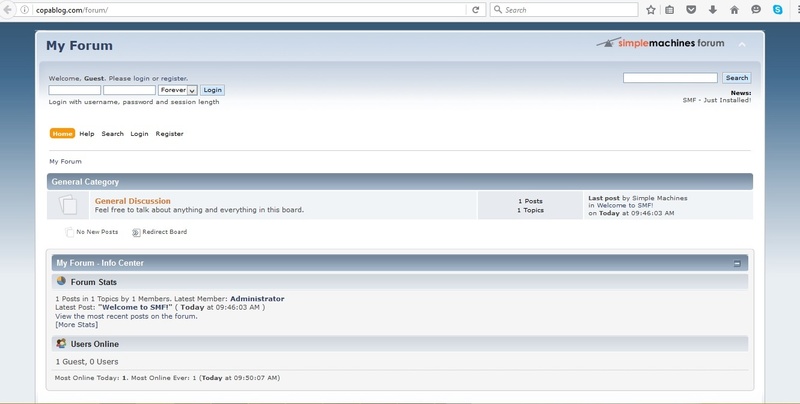 Upon providing the correct admin details, you will be taken to the main dashboard which will help you manage the forum. There are a few configuration steps required at your end, before you can open the forum to public. The main configuration steps will be explained in detail in another post. The post is intended to help anyone trying to start a forum in their website. The installation is quite easy to handle, especially with a control panel like cPanel and Softaculous. Hope the post helps you to install Simple Machines Forum without trouble. 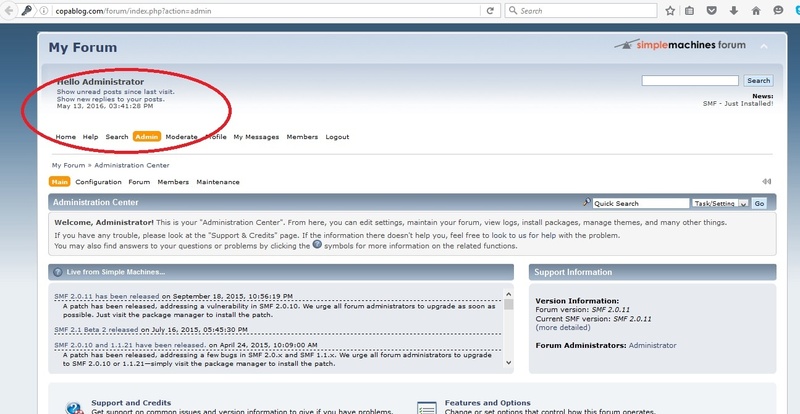 After installing SMF Forum, you can also ready this article about how to configure simple machines forum.